Normally, I don’t concern myself with gaining 3-5 pounds over the winter. Shorter days, more eating holidays, fewer steps, etc. Any weight that I gain, will fall off in the spring. Today, I stepped on the scale to learn that I didn’t gain the expected 3-5 pounds. I lost 3 more pounds. I didn’t even try. The habit I developed of eating meals high in protein and boiled potatoes gets stronger every week. I don’t even need to think about. It is like cruise control. That is by design. I know if I eat several P&P meals a week, I won’t gain weight. And if I eat a few more, I’ll drop weight. This winter my eating window was often 12-13 hours, which normally results in weight gain. Also, I occasionally had ice cream, pizza, and foods that people normally associate with gaining weight. But I was never concerned. I knew that locking in calorie savings once or twice a day from P&P meals would keep me at or near my ideal weight. No hunger. No calorie counting. Another thing I didn’t do this winter was any form of fasting. I don’t like to fast when it is cold. And I still dropped weight. So many people need to lose weight and they need to do it in a way that the brain doesn’t detect hunger. Otherwise, the risk of regaining the lost weight (and more) is higher. 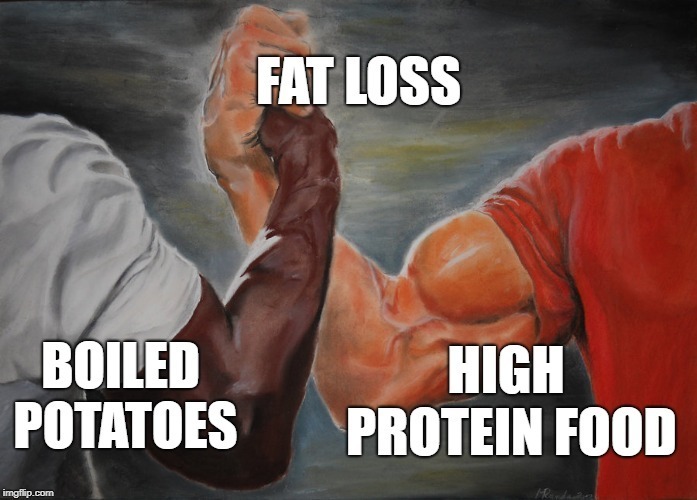 Potatoes & Protein is the key. It works. It is a simple story. Build a habit with staples and execute without thinking. This winter I also experimented with replacing the potatoes with various grains, including quinoa, oats, farro, millet, barley, couscous, brown rice, and even white rice. It still works, so all you tater-haters have no excuse. Did anyone else try P&P this winter? What were your results? I like these posts a lot. Swapping a meal a day for P&P seems doable. I like potatoes, and eggs, so I’ll probably try that combination. Good reminder about your successes with P&P. Regarding rice, I find that I’m able to eat far more rice than I am potatoes. I’ve seen similar comments about rice vs. potato satiety on quite a few other blogs that mention rice as an alternative to potatoes. Have you found this to be the case as well? @Ryan – Yes, I can eat more rice than potatoes. But, the satiety from potatoes can crowd out the protein. So the key with eating rice is to focus more on the protein, which for me has more long term satiety. If I want to crush hunger now, I reach for more potatoes. If I want to crush hunger later (go a longer period between meals), I focus more on the protein. In those cases, rice is a great tool.